Some smart moves by the Guardian. They’ve created their own mini science blog network, containing some top names and proven bloggers. There are currently five blogs: Punctuated Equilibrium, Political Science, The Lay Scientist, Life and Physics. The fifth blog, in case you were concerned about my ability to count, is going to rotate between various bloggers, the first of which being the brilliant Mo Costandi of Neurophilosophy. I would normally subscribe to each of these blogs individually, so it’s nice to see them all under one digital roof of science-blogging goodness. 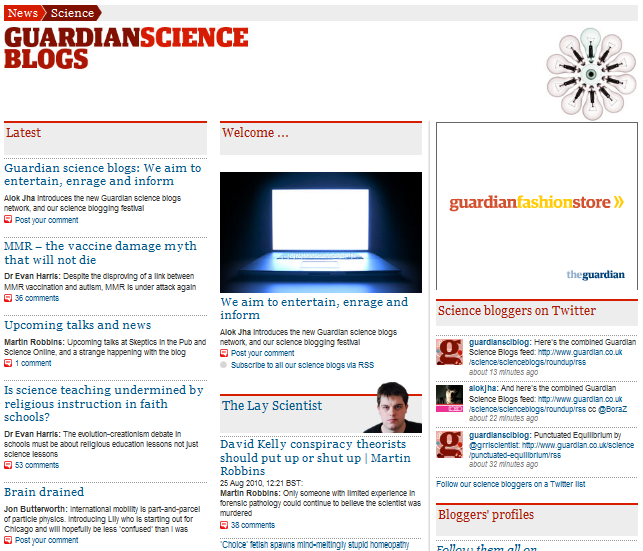 Btw, here’s the RSS feed for all the blogs: http://www.guardian.co.uk/science/scienceblogs/roundup/rss. Every post behind a cut tag plus required registration for comments — those are two presentation decisions that make it really unlikely for me to get into the content. Sorry, Guardian.